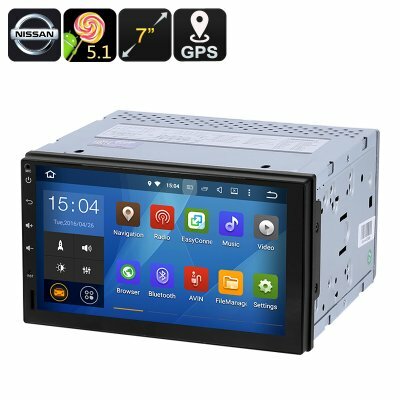 Successfully Added Universal Nissan 2 DIN Car Media Player - 7-Inch display, Android 8.0.1, GPS, Bluetooth, Google Play, FM Radio to your Shopping Cart. If you are looking for the ultimate way to pimp up your Nissan then search no further. This 2 DIN car media system that fits in any Nissan car is guaranteed to customize your car like no other gadget out there. With its beautiful 7-Inch HD display, this dual DIN car entertainment system lets your passengers enjoy the latest movies, music, and Android games while waiting to reach the next destination – assuring that never again a single moment of boredom will enter your car. With Google Play installed, this two DIN media player provides you with access to literally millions of free to download Applications, games, movies, and more – bringing along unlimited fun and entertainment for everybody in your car. Running on an Android 8.0.1 operating system, this 7-Inch car entertainment system comes packed with all the trusted and familiar features that are loved by all Android users out there. A powerful Quad-Core CPU lets you engage in demanding gaming sessions that, thanks to the media player’s stunning HD display, can be enjoyed to their absolute most. Its large display furthermore features an adjustable brightness design, letting you enjoy all this media player has to offer even whilst located in direct sunlight. With 16GB of internal storage available you can be assured that this media player for your Nissan holds enough space for you to save all your favorite games, movies, and songs. Thanks to its Bluetooth support, this Nissan car entertainment system can be easily synchronized with your smartphone and other Bluetooth enabled devices. Access your smartphone music library and enjoy your favorite songs in audiophile grade quality, or simply control your phonebook and engage in hands-free phone calls while on the road – with this Bluetooth media player your options will be truly limitless. Additionally, this Android car entertainment system furthermore features regular FM and AM radio settings, providing you with the possibility to listen to the latest songs, the news, and popular talk shows at any given moment. Besides working as a high-end media system that lets your passengers enjoy the latest movies, most popular applications, and stunning games – this 2 DIN car media system also functions as a highly accurate navigation system. With its built-in GPS feature, this Android entertainment system for in your car provides you with the most up to date traffic information and route descriptions to your next destination whenever requested. Using Android Maps, you will be efficiently able to insert the map of any location you’re headed – ensuring that no matter where you’re located, you’ll always reach your next destination on time and never have to fear about getting lost again. This Nissan 2 DIN car entertainment system comes with a 12 months warranty, brought to you by the leader in electronic devices as well as wholesale electronic gadgets..
Arabic: - الدين 2 سيارة ميديا بلاير - Chinese Simplified: - 2 DIN 汽车媒体播放器 - Czech: - 2 DIN Car Media Player - Dutch: - 2 DIN auto mediaspeler - French: - 2 DIN voiture lecteur de Media - German: - 2 DIN Car-Media-Player - Hebrew: - נגן המדיה של המכונית דין 2 - Hindi: - 2 DIN कार मीडिया प्लेयर - Hungarian: - 2 DIN autós média lejátszó - Italian: - 2 DIN auto lettore multimediale - Japanese: - 2 DIN の車メディア プレーヤー - Korean: - 2 DIN 자동차 미디어 플레이어 - Malay: - Pemain Media kereta 2 DIN - Norwegian Bokmål: - 2 DIN bil Media Player - Romanian: - 2 DIN masina Media Player - Russian: - 2 DIN автомобильный медиа-плеер - Spanish: - 2 DIN coche reproductor - Thai: - เครื่องเล่น 2 DIN รถ - Turkish: - 2 DIN araba kitle iletişim araçları oyuncu - Vietnamese: - Máy nghe nhạc phương tiện truyền thông xe 2 DIN.